It’s holiday cookie season! This is one of our annual must-haves – Russian Tea Cakes, otherwise known as Mexican Wedding Cakes or in our house, Mom’s Nut Balls. 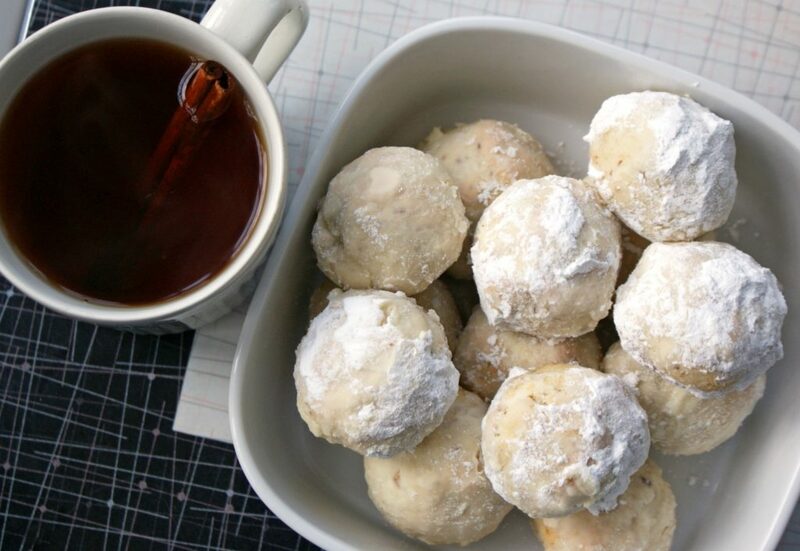 They’re bite-sized shortbread balls made with finely chopped pecans or almonds (some even use hazelnuts), rolled in icing sugar while they’re still warm, which creates a sort of buttery frosting on the outside. Whatever you call them, they’re irresistible – and look delicious on a cookie tray, or bundled up in cellophane and tied with ribbon to give as a gift. Since they last well and are nice and compact, they’re also perfect for cookie exchange parties – it’s one of my go-to recipes. Place nuts in a dry baking pan and toast in the oven (you can do it on the stovetop instead if you like) for 5–8 minutes, until lightly browned and fragrant. Give the pan a shake once in awhile to ensure even browning. Cool and finely chop by hand or in a food processor. In a medium bowl, stir together the flour, cornstarch, salt and nuts; set aside. In a large bowl, beat butter, oil and icing sugar with an electric mixer for 2 minutes, until light and fluffy. Add milk and vanilla and beat until smooth. Add the flour mixture to the butter mixture and stir by hand just until the dough comes together. Shape into walnut sized balls and place about an inch apart on an ungreased cookie sheet. Bake for 12-15 minutes, until golden on the bottoms. Meanwhile, put some icing sugar in a shallow dish. Remove cookies from the cookie sheet while they’re still hot and immediately roll in icing sugar to coat them, then place on a wire rack to cool.